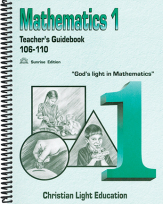 A Canadian version of Math 100 is available by clicking here. Sunrise edition. Integral to teaching Sunrise Math 100. Day-by-day instruction for laying a good math foundation in the first grade, with suggested oral activities and flash-card work. 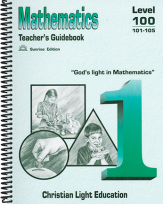 Also contains a reproduction of LightUnits 101-105 with answers. Sunrise edition. Integral to teaching Sunrise Math 100. Day-by-day instruction for laying a good math foundation in the first grade, with suggested oral activities and flash-card work. Also contains a reproduction of LightUnits 106-110 with answers. 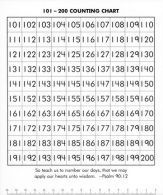 Students journey to 1,000 by writing ten numbers a day with reward activities at intervals along the way. Correlates with Sunrise Math 100 and Canadian Sunrise Math 100. Use with dry erase marker to help show number patterns and relationships as they are taught. Used with Sunrise Math 100 and Canadian Sunrise Math 100. Cards are numbered and tabbed for easy sorting as outlined in the Teacher's Guides for Grades 1-4. The cards cover the addition and subtraction facts from 0-18. Required for Math 100-200. 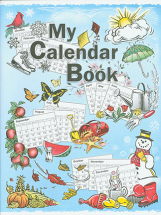 Enrichment activities with charts, graphs, and statistics related to calendar and weather. Handy teacher notes included with the workbook. 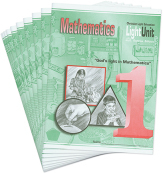 Can be used as a math supplement for students in grades 1, 2, or 3. This sturdy clock is made of durable plastic. 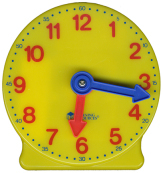 Gears maintain the correct hour and minute relationship and color-coded hour and minute markings make this colorful clock an asset to teaching your children to tell time.